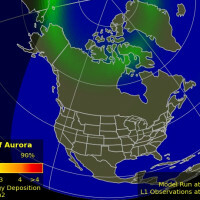 Solar wind flowing from the indicated coronal hole should reach Earth on ~Dec. 17th. Credit: SDO/AIA. Noctilucent Clouds The southern season for noctilucent clouds is about to begin. 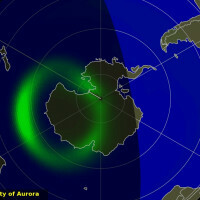 Monitor the daily daisies, below, from NASA's AIM spacecraft for the first wisps of electric blue above Antarctica. "The Geminids were so bright and active that I could see them through the lights of the city," says Dai. 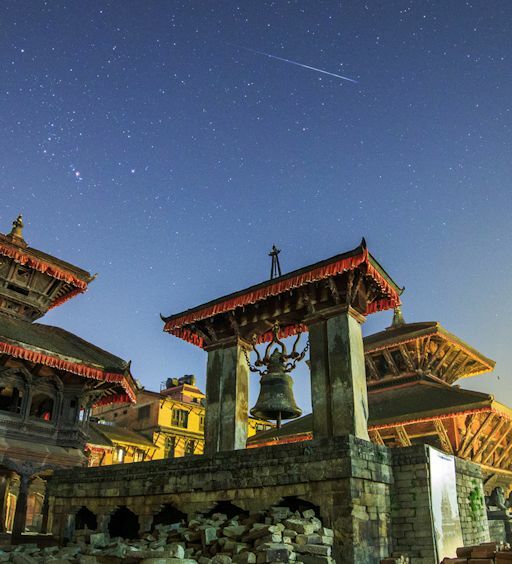 "Bhaktapur Durbar Square is the plaza in front of the royal palace of the old Bhaktapur Kingdom. It is one of three Durbar Squares in the Kathmandu Valley in Nepal, all of which are UNESCO World Heritage Sites." 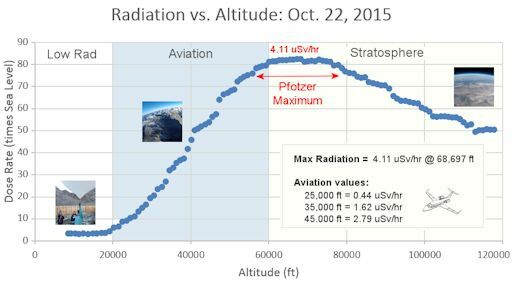 Worldwide observers have reported meteor rates as high as 100 per hour in dark-sky locations. Counts should decline tonight, Dec. 15-16, as Earth begins to leave the debris stream. For now, though, the Geminids remain active. 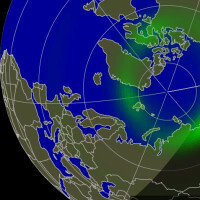 The best time to look is during the dark hours between local midnight and dawn. "Just as I was heading out to de-ice the car on Dec. 14th, I looked up and noticed the most incredible cloud formation," says Skinner. "At the same time, an excited text came through from my boss, aurora tour guide Chad Blakley, who having lived here for many years has seen this only once or twice and explained to an Arctic newbie like me how rare these formations really are." 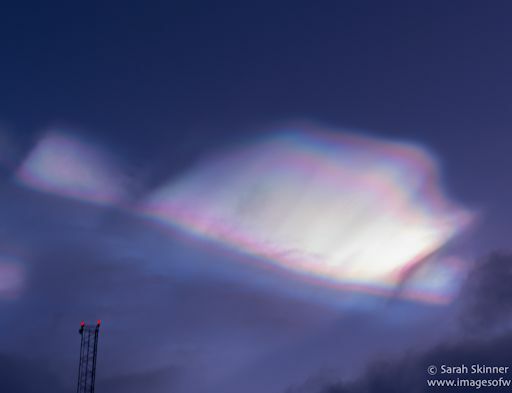 Also known as "nacreous" or "mother of pearl" clouds, the icy structures form in the lower stratosphere when temperatures drop to around minus 85ºC. Sunlight shining through tiny ice particles ~10µm across produce the characteristic bright iridescent colors by diffraction and interference. Once thought to be mere curiosities, some PMCs are now known to be associated with the destruction of ozone. "Nacreous clouds far outshine and have much more vivid colours than ordinary iridescent clouds, which are very much poor relations and seen frequently all over the world," writes atmospheric optics expert Les Cowley. "Once seen they are never forgotten." 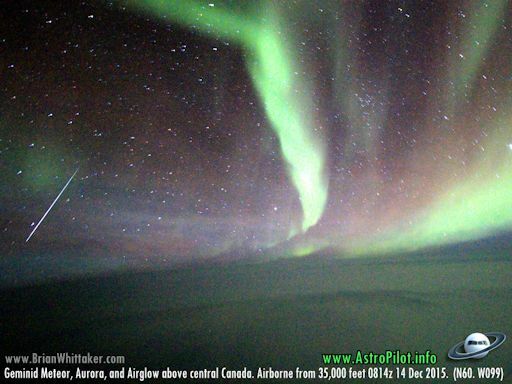 "In addition to the auroras, the Geminid meteor shower was very active," says Whittaker. 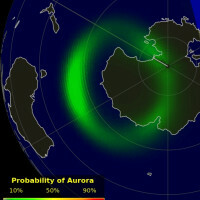 On Dec. 15, 2015, the network reported 244 fireballs. On December 15, 2015 there were 1645 potentially hazardous asteroids.